Girly Girl Giveaways: Time for some relaxation! Recently my doctor told me I need to learn how to relax. I have a tendency of stressing over things, be them big or small. Some of the tips my doctor suggested for relieving stress were keeping a journal, meditating, and taking time to breath. All things that I am trying to incorporate into my life. Another thing that is really relaxing for me is baths. I used to enjoy soaking in a warm hot tub but unfortunately this is something I have not done in awhile. Recently I was sent some natural bath products from Kneipp for review. Coincidentally enough from their product line labeled Relaxing. Kneipp's Relaxing products contain lavender which is said to have a calming effect, relieving tension and easing nerves, among other properties. Relaxing Aromatherapy Bubble Bath not only creates luxurious bubbles, but it moisturizes yours skin with the addition of coconut oil while you soak and breath in the rich lavender scent. I didn't realize how much I was missing a relaxing bubble bath. I also received Relaxing Body Lotion. This lotion is perfect for after you exit the tub and want to give your skin some added nourishment with the help of vitamins A and E. It also makes a great massage lotion, another relaxing activity. Finally, Relaxing Hand Soap to gently cleanse your hands. As I mentioned earlier my doctor provided me with some stress relieving breathing techniques, using the diaphragm, to try out at home. I have been including this hand soap into these. I wash my hands and than take deep breaths into my palms, all while inhaling the lavender scent. It may sound silly but I never realized how much I can clear my mind by just focusing on deep breathing. 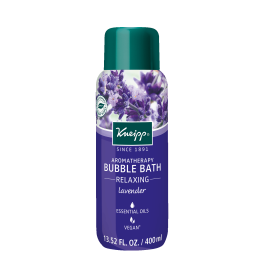 You can find these and other Kneipp products online. Also don't forge to enter the Kneipp Life Sweepstakes for a chance to win a relaxing vacation or a basket filled with Kneipp goodies.